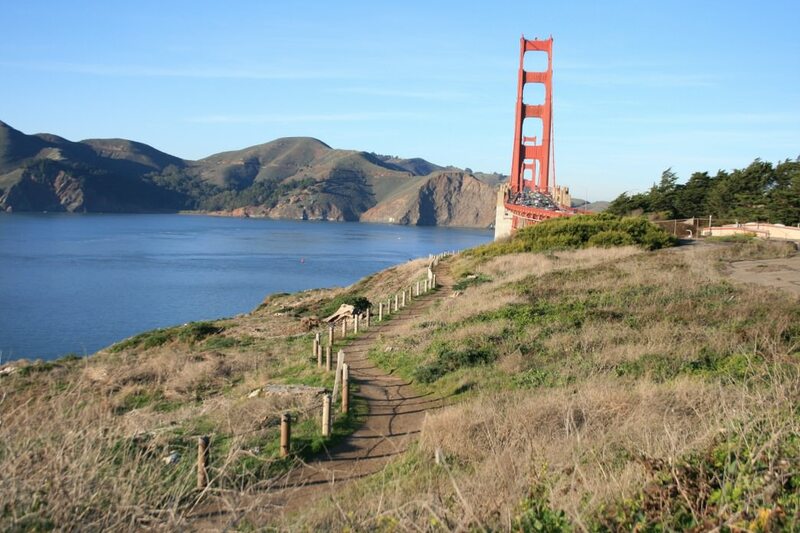 The Presidio offers 24 miles of trails, many of which have views of the Golden Gate Bridge and Pacific. 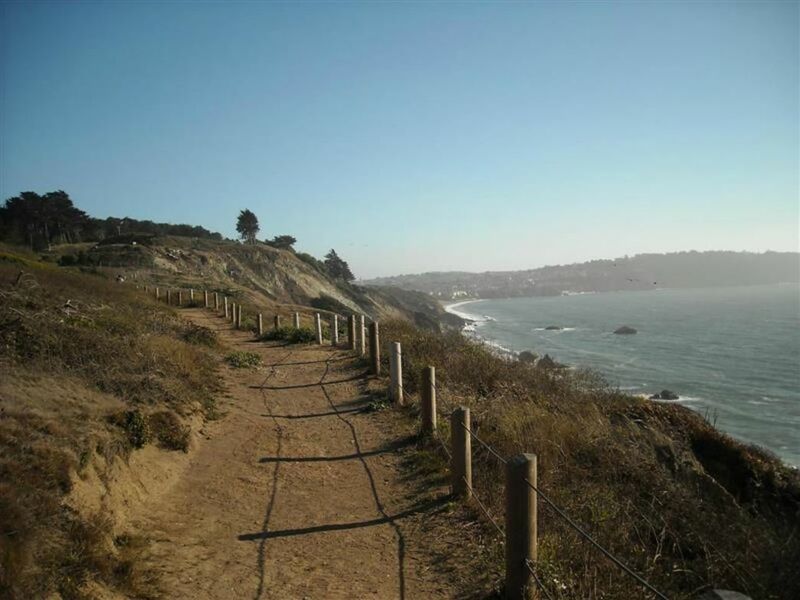 Hiking trails in the Presidio offer unparalleled views of the Pacific Ocean. Routes range anywhere from the scenic but short (0.7-mile) Batteries to Bluffs Trail to longer excursions like the California Coastal Trail. Avid hikers can link up several routes for added mileage. Count on some hills and climbing no matter which route you choose along these coastal trails; be sure to keep an eye on young children, as some trails have steep drop-offs. The exception is the flat stretch of paved and dirt trail along the Golden Gate Promenade, which technically part of the Presidio, and is better suited for families and strollers. While summer usually means warmer weather, you'll also have to contend with more crowds. Winter rains can muddy up some trails, but cooler temperatures also mean less hazy views. Early spring is an ideal time as wildflowers start to bloom and summer tourist season has yet to heat up. Pets are welcome in the Presidio but must be leashed. There is no fee to enter the Presidio, but expect to pay for parking the closer you get to the Golden Gate Bridge. You can find some of San Francisco's last remaining free spots at Marina Green and beside the barracks and warehouses along Old Mason Street, but be sure to check for signs first. With unparalleled views of the Pacific, Alcatraz, and the Marin Headlands, the 24 serene miles of trails in the 1,491-acre Presidio, a former Army post, offer a perfect way to escape into nature within the confines of the city. Take your pick of world-class vistas (and eight overlooks) along the trails: rugged coastline to the west, sailboats and windsurfers cruising along the bay, serene redwood groves, and historic landmarks like the San Francisco National Cemetery, the final resting place of more than 30,000 soldiers. Whether you’re craving a solo excursion or heading out with the whole family, you're all but guaranteed that the magic of the Presidio will be an unforgettable place to enjoy the outdoors in San Francisco. There’s a trail for every type of hike in the Presidio, from a flat stroll along the Golden Gate Promenade to a more ambitious excursion involving stairs and steep climbs. A series of trail improvements over the last few years has improved signage and trail conditions, making it easier to navigate the network of trails. Still, a map is recommended, as it’s easy to get lost—but, in this serene oasis, that can be half the fun. Here, a few recommended options. Batteries to Bluffs Trail: Don’t let the short distance—0.7 miles one-way—fool you: The route features some quad-busting steps and climbing, especially if you want to take the side trip down to Marshall Beach (and you probably do). The trail winds past two historic WWII gun batteries and offers up unbeatable views of the Golden Gate Bridge and Marin. Presidio Bay Area Ridge Trail: Get a scenic taste of the entire 550-mile Bay Area Ridge Trail, which circles the entire bay, on this 2.8-mile stretch from the park’s ridgeline at the Arguello Gate all the way to the Golden Gate Bridge. Highlights along the way include the serene National Cemetery Overlook, the final resting place for 30,000 soldiers, coastal gun batteries, a dramatic, 90-foot-tall sculpture called Spire from artist Andy Goldsworthy, made from the trunks of 38 cypress trees, and of course, stunning views of the bay, ocean, and forested landscapes in the park. California Coastal Trail: Take an unforgettable 2.8-mile hike along the Presidio segment of this 1,200-mile route, which runs along the Pacific coastline from Mexico all the way up to Oregon. The trail connects Baker Beach to the Golden Gate Bridge through the rugged coastal bluffs of the Presidio, dotted with gun batteries, picturesque picnic spots, and sandy beaches, not to mention dramatic coastal views. 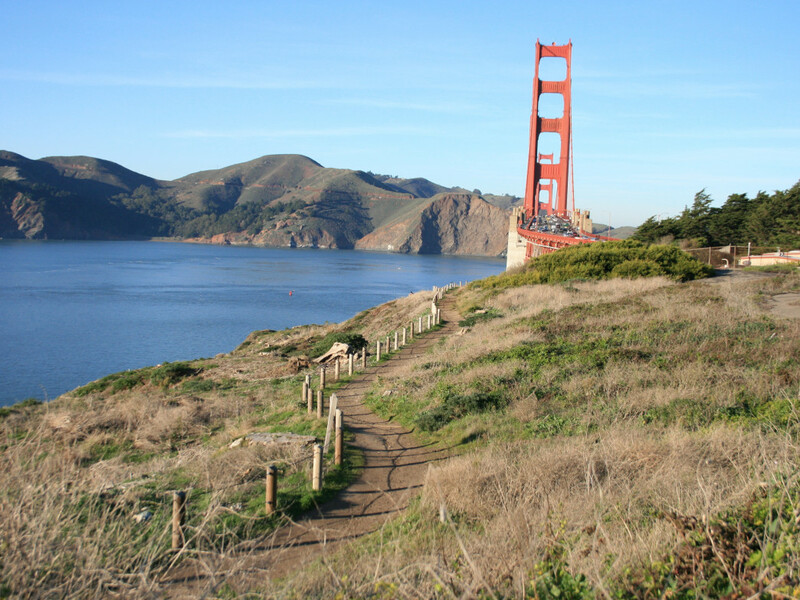 At its northern end, the trail continues across the Golden Gate Bridge to the Marin Headlands, and also connects to the Bay Trail, which provides access to Fort Point and Crissy Field. To the south, it connects to the park’s 25th Avenue Gate and the city’s Richmond District. Urban adventurers, families, and visitors who want to soak in some of San Francisco’s most breathtaking panoramas will find plenty to choose from with the hiking trails at the Presidio. Parents can select trail distances appropriate for little legs and attention spans, while ambitious hikers can easily spend a day exploring. There are no permits or fees at the Presidio; all trails are free, and the park is open 24 hours a day. You'll find plenty of ample parking, too, but you can also opt for the free transit service via the free PresidiGo shuttle, which stops at spots throughout the park and also services downtown.